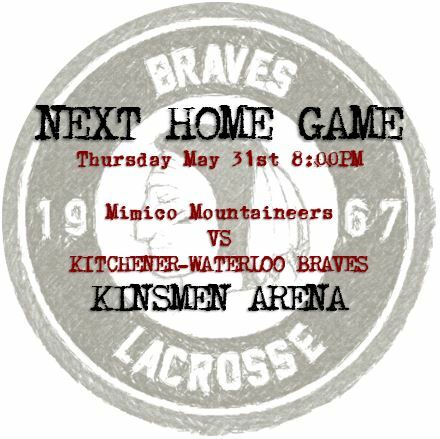 The KW Braves Alumni Playoff Hockey Pool in support of the KW Braves Junior “A” lacrosse team is now ready for your entries. This hockey pool is open to anyone and everyone, family, friends, coworkers, neighbours and foes. This is a 50/50 pool with winnings going to the Top 3. Winnings are dispersed at a 50/30/20 split. DEADLINE is FRIDAY APRIL 13th @ 7:00pm EST. 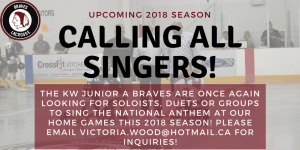 The KW Braves are looking for individuals to sing the National Anthem at our home games this 2018 season. We are looking for soloists, duets or groups to create a welcoming atmosphere for our fans! Please email victoria.wood@hotmail.ca for inquiries and more information! ‘Tis The Season! 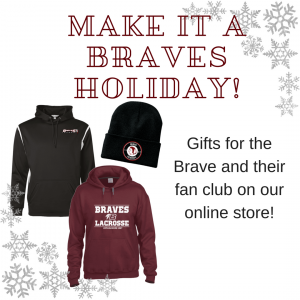 Visit Our Online Store to Purchase Customizable Apparel! THANK YOU! 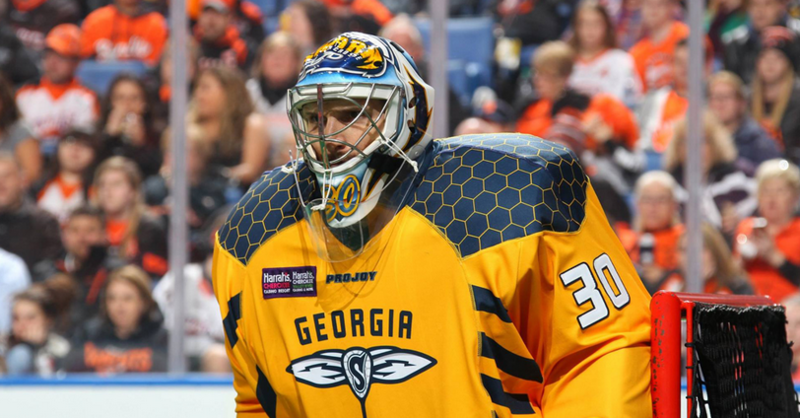 Damon Currie for your time with the Braves! All the best with the Burlington Chiefs! 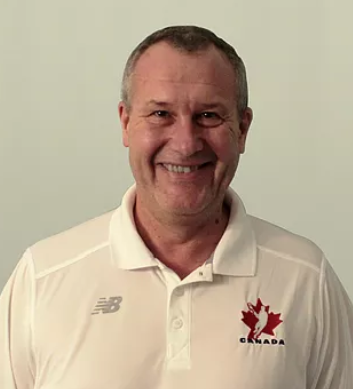 Congratulations to Dr. Steve Macgregor on being presented the Mr. Merv MacKenzie, presented annualy to the person elected as having done the most promotion of lacrosse in Ontario. REGULAR SEASON HOCKEY POOL – Sign Up Now !!!! 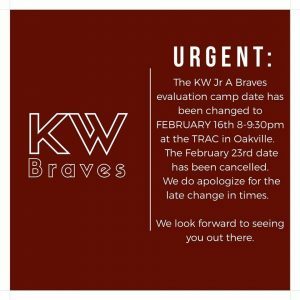 It is that time of year for hockey pools and the KW Braves would love to have you join our pool. This is a fundraiser and 50% of all proceeds go to the top 3 winners. This pool is open to everyone so enjoy the fun and sign up. 7. Make a selection in all 25 boxes and once completed with all selections, click SUBMIT ENTRY – only click SUBMIT ENTRY once all selections have been made. Hockey Pool – It’s coming soon !!! 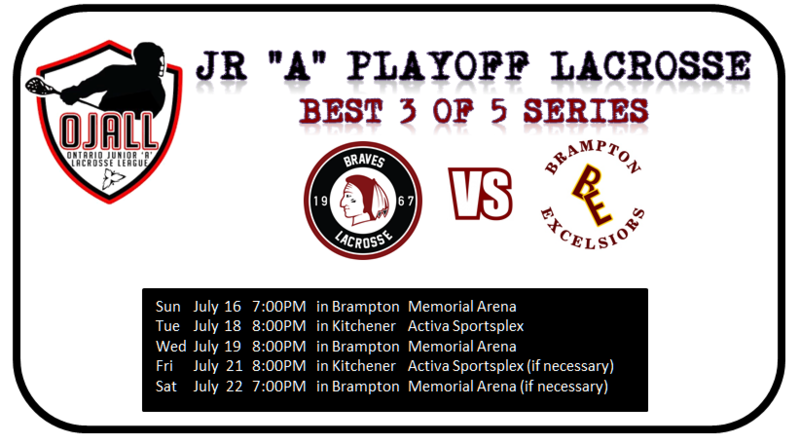 The KW Braves season ended on July 19th with a loss to Brampton Excelsiors, losing the best of five series 3-0. 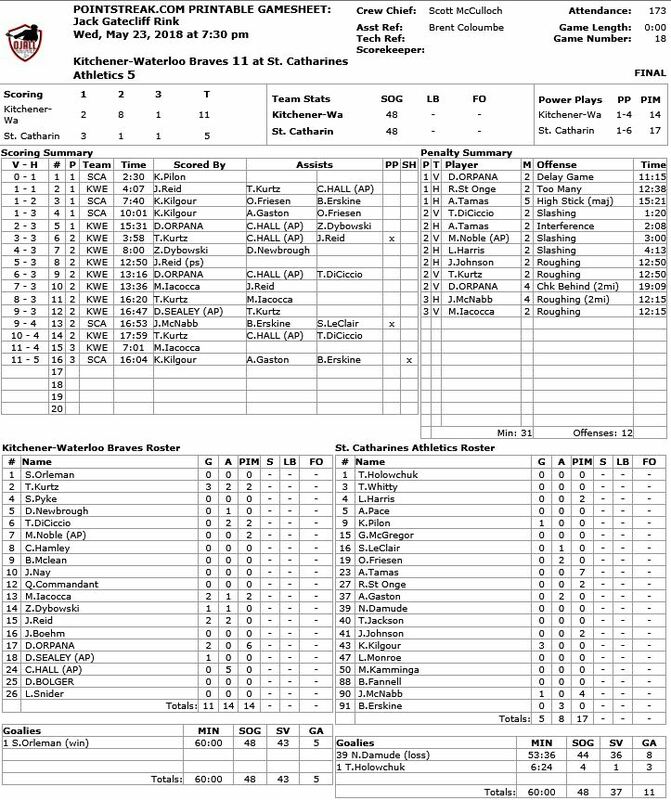 All the best to the Excelsiors in their drive for the Minto Cup. 2017 had a very slow start for the Braves as we awaited the return of numerous players into the lineup. 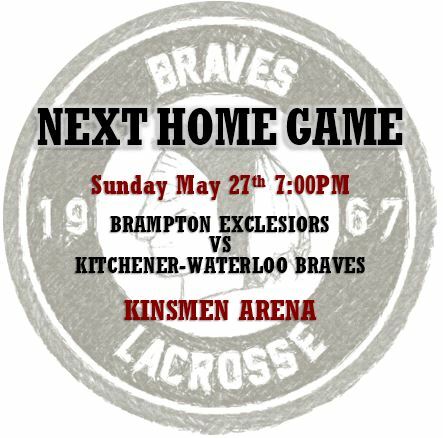 As we neared the end of the season, the Braves did get on a roll and were able to take the 7th spot in the standings with an exciting OT win in our final game. 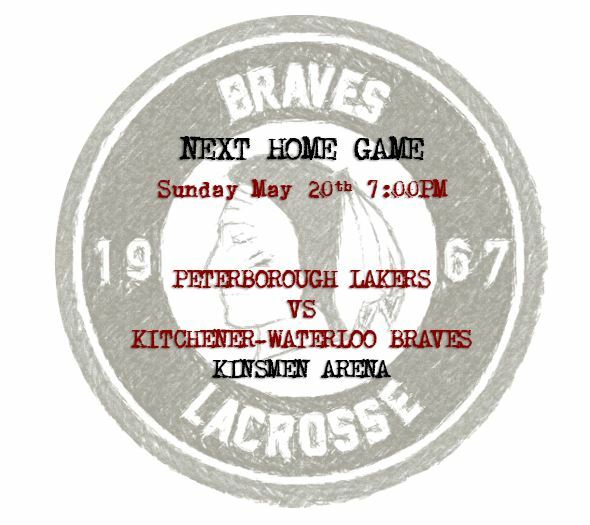 Losing the series to Brampton hurt, although we were the underdog, we expected and wanted to win. The Braves have a youthful core of players and we know our better years lay ahead of us but that doesn’t take the pain away from losing. The pain is especially hard for the 4 players that are graduating. We wish these four young men all the best in the future. You will all be missed but a special thank you to Connor Cole our captain who played his 5 full seasons with the Braves. Thank you. 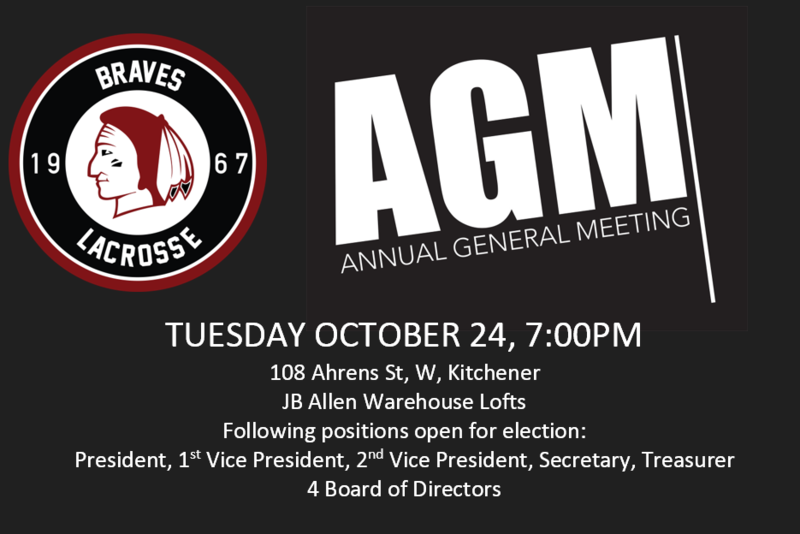 To the entire board of directors, thank you for your year round efforts in helping to keep the KW Braves alive and well in junior lacrosse. We made great strides this year and none of this would have been possible without your dedication. To our coaching and management staff, Chris Driscoll, Corey Hallman, Kevin Lorch, Steve Keleher and Jeff Williamson, thank you for your perseverance, patience and commitment. 2017 didn’t go as planned but the with all of your guidance and leadership, there was no quit in the Braves. Start planning for next year now, we see good things. Elora Mohawks, Guelph Regals and Wilmot WIld, thanks to our affiliates for providing the much needed player support when required. It isn’t always an easy task to coordinate but your cooperation is greatly appreciated. A huge shout out to our many sponsors who have been more than generous in their support of the Braves. We certainly appreciate your help in keeping the Braves strong for over 50 years. And to our fans, wow, our numbers were up considerably this year and we thank you. Activa was rocking thanks to you. This was our 50th anniversary season and the celebrations to honour this milestone brought back many players from the past. It was a year of many memories, some that will remain with us forever. Keep following us on social media, we will keep everyone updated with the happenings with the Braves.